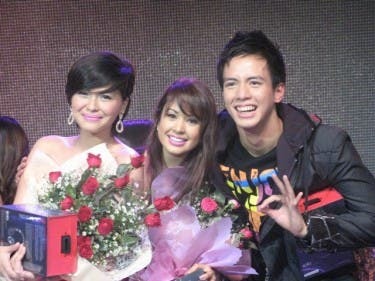 A singer, a swimmer and a fine arts student are MYX VJ Search 2011 winners. MYX, the country’s No.1 music channel, proudly named RnB sweetheart K-La Rivera, swimming hottie Mike Advincula and quirky Fine Arts student Joyce Pring as its newest music video ambassadors in the MYX VJ Search 2011 finals night held Wednesday (July 27) at The Block activity center, SM City North Edsa. Despite the heavy rains brought by typhoon “Juaning,” fans filled the venue to witness this historic announcement and the performances of the MYX VJ finalists themselves, Chavacano band Maldita, Callalily lead vocalist Kean Cipriano and electronica music-artist Somedaydream. VJ K-La, the Filipina-Canadian who first started her stardom journey via ABS-CBN’s hit singing competition “Star Power,” said becoming a MYX VJ was really “a dream come true.” Now she’s excited with her new stint, and she looks forward to just having fun. “I would love to balance both singing and being a MYX VJ. But right now, I’m really focused on developing myself as a VJ. I’m working on my Tagalog,” said VJ K-La. VJ Mike, the captain of the De La Salle University swimming team, on the other hand, believes his “unpredictable” personality have encouraged MYX fans to vote for him. He was also surprised with the outpouring of support his family gave during the finals night. “I started out as a quiet guy, then unti-unti kong inilabas ang tunay na kulay ko and it really worked out. So, I’m really excited to live a new life, because ever since I’ve been living a life as a student athlete,” he said. In joining this year’s MYX VJ Search, the 6’1” swimmer actually sought the advice of his team mate Enchong Dee, who is also one of Kapamilya network’s brightest leading men. Enchong’s advice seems to have brought Mike to victory. “When I entered the competition, I asked Enchong right away. What shall I do? Then he advised me to just be myself,” VJ Mike shared. For University of the Philippines Fine Arts student VJ Joyce, spontaneity and her quirky character are just some of what she can offer. She thanked her fans, who call themselves the “Pringles” for believing in her. Filipino-American stunner Drew was also a big winner of the night, as he received two special awards—as winner of SM Accessories challenge together with VJ Joyce, and as Coca-Cola Happiness VJ together with Cara. Members of the audience kept on screaming as Kean, who will be the MYX Celebrity VJ for the month of August, sang “Wala Na Tayo.” While Somedaydream, the Philippines’ answer to American electronica act Owl City and Zamboanga-based band Maldita drew cheers and applause from the very appreciative teen crowd. The MYX VJ Search finalists also showed off their confidence on the catwalk in a mini fashion show showcasing SM Accessories. They also enthralled everyone with their dance number. Now on its fifth year, the MYX VJ Search has produced well-loved hosts like sophomore VJs Chino Lui Pio, Bianca Roque and Janine Ramirez, and freshman Robin Nievera. Senior VJs Luis Manzano, Nikki Gil and Iya Villania are now well-recognized as hosts and are busy hosting more than one show on MYX and ABS-CBN. Always tune-in to MYX (SkyCable Channel 23) for the hottest news on this year’s MYX VJ Search.